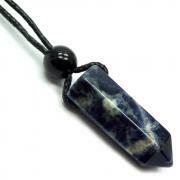 Wrapped Pendant (1" - 1-1/2") w/ Cotton Cord - 1pc. 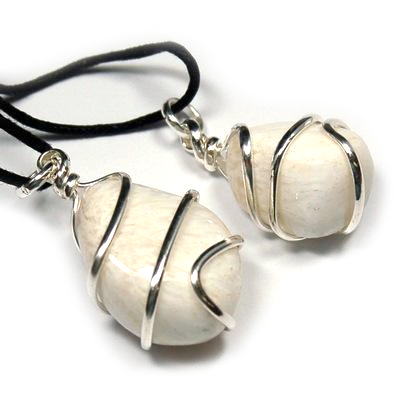 Tumbled Scolecite (Wrapped) Pendant (India) - These Tumbled Scolecite (Wrapped) Pendants from India are wire-wrapped with a silver-plated wire and have an 18" cotton cord. Scolecite works best on the Third Eye and higher Crown chakras, instilling a sense of peace and stillness to the mind and body. It is especially beneficial to those who are driven to panic attacks in crowded rooms, bringing about a calm and relaxed state of mind. Scolecite brings about a restful sleep, which is ideal for insomniacs. 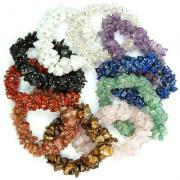 Meditating with Scolecite enhances communication with spirit guides. In the workplace or home, Scolecite brings about a “team” atmosphere, helping all to work toward a common goal. 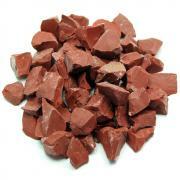 Physically, Scolecite aides the immune system, nervous system and muscular system. It can help with blood issues such as poor circulation, and has been known to assist with weight loss. Affirmation: I am connected to every realm of the Universe. Question: Do you meditate to find stillness? Discontinued - Tumbled Black Agate Keychain - 5pcs.